Every spring, New Orleans kicks its already intense party vibes into an even higher gear with the arrival of Mardi Gras, Fat Tuesday, and BUKU Music + Art Project. BUKU – pronounced like the French word for “a lot” — is indeed a big deal, even if it’s a boutique event. Beginning in 2012, this annual two-day festival is a cool, eclectic tribute to New Orleans, and to today’s most progressive music genres and artists. Its Phase 2 lineup just dropped today as proof. The bill is a diverse and vibrant group of artists spanning EDM, hip-hop, psych rock, R&B, and more. Added today were Migos, Porter Robinson's new project Virtual Self, pop punk-inflected rock band A Day To Remember, Rezz, Bonobo (DJ set), Little Dragon, Ganja White Night, Boogie T, Green Velvet, Jay Electronica, Snakehips, Rich The Kid, Famous Dex, Gryffin, Princess Nokia, Emo Nite LA and more. 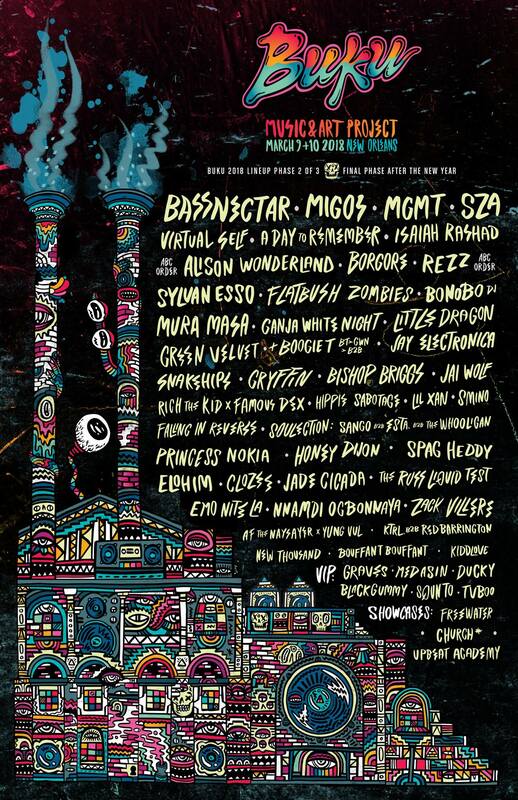 These talented performers join an already stacked lineup of names including Bassnectar, MGMT, SZA, Alison Wonderland, Isaiah Rashad, Borgore, Sylvan Esso, Flatbush Zombies, and others. The complete lineup will be confirmed early next year. Check out the rest of the talent below. A short walk from the French Quarter, BUKU oozes with the quirkiness inherent in its bustling hometown, mixed with an underground house party vibe and big-time festival flavor. From the signature BUKU Graffiti Wall – which rises up and comes to life throughout the weekend – to the classic New Orleans food, to the dozens of pop-up street performers and art exhibits brought on-site, BUKU blends the rich, multifaceted traditions of New Orleans with the creative, youthful culture that is fueling the New Orleans of the future. One of the stages is even in a Mardi Gras float manufacturing warehouse. Can you even get more NOLA than that?! Tickets are on sale for BUKU now. The festival goes off March 9-10, 2018, beginning a fresh festival season for many.